We are big fans of Build a Bear Workshop as you can read from my previous posts here, here and here. The boys love to go and the still take their bears to bed every evening. My youngest Tyler who is 3 adores soft toys, they go everywhere with him and he loves to snuggle into them. Build a Bear is perfect for him. The clothes you can get are fab and the little accessories, well let’s just say I wish Build a Bear was about when I was little. 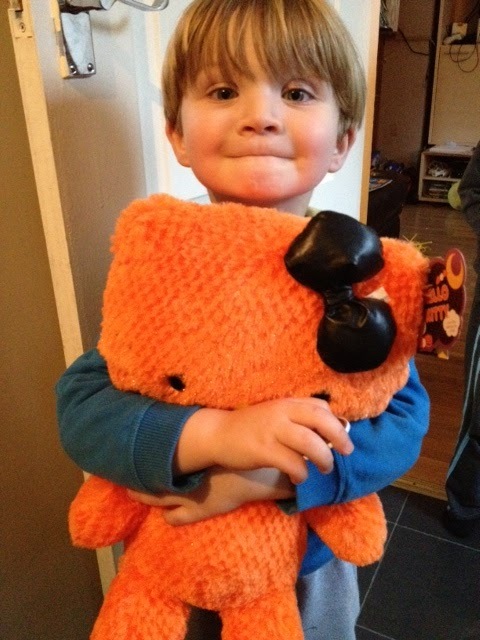 When we were sent a Halloween bear from Build a Bear Workshop he claimed it as his own. Lucas didn’t even get a look in. The Halloween additions from Build a Bear are a cute little bear with pumpkin print on his fur and a little pumpkin nose and a gorgeous orange Hello Kitty bear with a removable black bow. The spooktacular bear is a whopping 43cm in height, bigger than the average bear and is super soft and cuddly. I love the fact that she has a Hello Kitty inside a little pumpkin embroidered on his foot, so cute. What a gorgeous colour she is. You can see the size of this bear in the picture below with Tyler, he loves hugging this and she goes to bed with him every evening. He adores this bear. 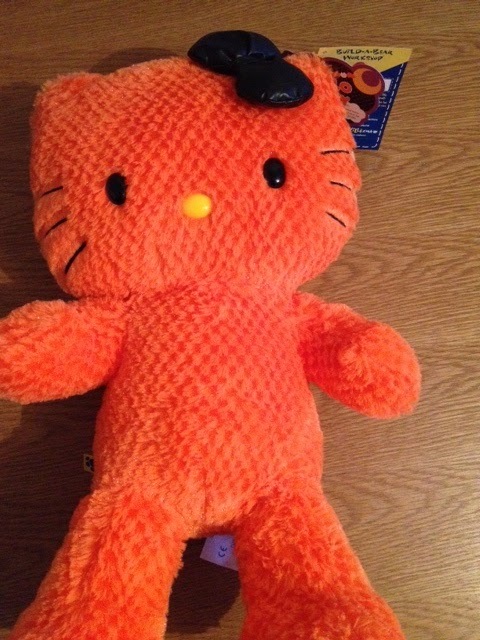 In true Build a Bear Workshop style, Hello Kitty can get her own Halloween outfits and accessories for the occasion, which can be bought separately. Priced at £20, she is a little more expensive than some of the bears, but as I said she is a lot bigger. I would say she is worth the money and super soft. Even though she is bigger she still fits into the normal build a bear size clothes. 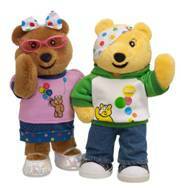 Also Build-A-Bear Workshop have partnered with Children in Need this year and they have some really cute Pudsey and Blush bears available in store and online with £5 from the sale of each bear going to the Children in Need charity. This year the new Pudsey is available with either a hoodie, jeans and cute trainer combo or with gorgeous set of cosy PJs! The ultimate gift for the little Build-A-Bear Workshop aficionado in your house. Pudsey’s best friend Blush is right on trend for BBC Children in Need this season, showing off her spots with a pretty polka dot matching bow and pink t-shirt. New for 2012, Pudsey smallfry™ comes dressed in a cool t-shirt with signature patch and paw print. New for 2012, Pudsey’s best new mini friend Blush smallfry™ wears a cute polka dot bow with fetching red t-shirt. Check out the Build a Bear Workshop website for more information. Disclaimer:- I was sent a Hello Kitty Halloween edition bear, but the review above is my honest opinion.